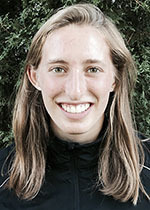 Sonya Jampel ’19 is the captain of women’s Nordic skiing. Photo courtesy of Sports Information. I started skiing in eighth grade, which is a little late to start. Most people either start skiing either when they learn to walk, or they get into it a little later. I started off trying all the other sports. I played soccer, I ran, I tried dance. Then, my friends from running said, ‘You should try skiing.’ What’s kind of cool about skiing is that it’s a family sport. So when I started, my brother and my sister started – and my parents didn’t know how to ski either – so they started. So we all started at the same time. My senior year of high school, I was competing at the Eastern High School Championships, and I was competing for Team Massachusetts. It was the last race of my high school career, and my brother and I were put on the co-ed relay together. I was a senior – he was a freshman. He did the lead-off leg and then handed it off to me. To actually be competing together was really cool. What’s the best thing about Nordic skiing? There’s a lot of things. One of my favorite things is the community because you just spend so much time together in ungodly temperatures and conditions that it creates a pretty close bond. I’ve been skiing in New England my whole life. So, like at the competition this weekend, my parents were there. The friends that convinced me to start skiing were there [competing for other schools]. My friend’s dad, who taught me how to ski, was there. It’s kind of crazy because I don’t know what year I’m in. I’m like, ‘This could’ve been eight years ago.’ But it’s really lovely to have that community that I am a part of. Also, the girls and boys on the team are some of my closest friends. What’s the relationship like between the women’s and men’s Nordic teams here? One of the best things about skiing is that both teams are pretty close. We have the same head coach, the same assistant coach, and our practices are all the same. All our events are at the same venue at the same day. It’s really special to be able to have such a close bond with the men’s team, and I consider [Nick Gardner ’19], the men’s team captain, my co-captain. It’s pretty cool that we get to be a part of three teams: I’m on the women’s Nordic team, the Nordic team and the Williams ski team. Does the team have any special or unique traditions? We have lots of traditions. During Winter Study we always go bowling, wearing our best bowling attire, which is usually something fun. One of my favorite events is during Mountain Day, when the Nordic ski team always goes on a long run up Mount Greylock and then meets the rest of the school at Stony Ledge. That’s always one of my favorite days of the year. The team also has some unique competition uniforms. Tell us about those. It’s a full spandex purple cow suit. Most teams are not their mascot, I would put that out there. It’s really good for recruiting 6-year olds. Lots of 6-year-olds want to be on are team. I love our uniforms. I think it’s really fun. As long as you are skiing fast, people are going to take you seriously. But you don’t want to take yourself too seriously. What’s your favorite ski course that you have competed at? I really liked our home carnival last year. Other sports get to have a home event every year, but we don’t get to do that. Usually we have one every other year, but my freshman year was moved due to snow. So last year was really my only home carnival. It was really special to be able to have all my friends from school and my family there. Skiing is relatively unique in that you need snow to practice. What does the team do in the offseason without snow? In the offseason we do a lot of running and hiking, so Williamstown is a pretty great place to be. We also do some lifting and we roller ski, which means that you have a metal ski with wheels on the end, and you go on the side of the road, with your ski boots and your poles and your reflective vest. I look pretty ridiculous. The roads here aren’t too busy, so that’s pretty lucky. Sometimes you’ll see us coming down Route 2. It’s also a great way to explore the area. If you could ski with any professor, who would you pick? Well, actually, I do ski with my professors, that’s kind of the funny part. The ski community is pretty special because it includes the Nordic ski team, but it also includes professors and others. I see my nurse practitioner up there or my professors and their children. Our faculty representative, who is actually retired now, is David Dethier. He worked in the geosciences department and is often out there with his wife and we’ll ski with him for a few minutes. Professor Nick Howe from the environmental studies department is up there sometimes. It’s a community, you see the same people every time.